Welcome to our Spanish For Kids section. 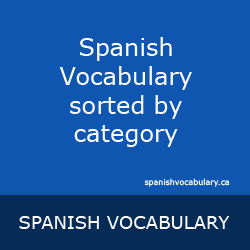 Our Level 1 Children's Spanish section features introductory Spanish vocabulary for students. Each lesson is based on a specific theme and also contains a group of numbers to continue practising counting in Spanish. The lessons contain Spanish audio and free, full color vocabulary sheets (PDF) to download and print. Teachers may use the vocabulary sheets in their classrooms. The material has been divided into 10 lessons with a variety of vocabulary.